Originally posted: April 17, 2019 . Last modified: April 17, 2019 . 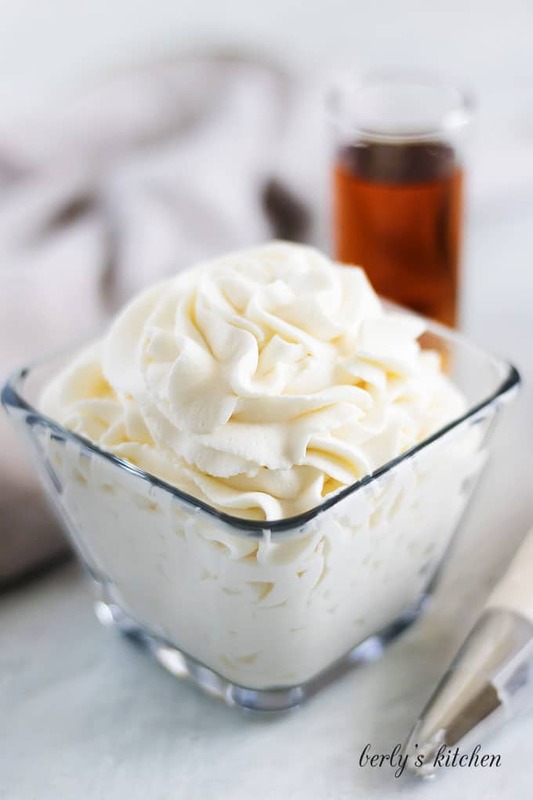 A deliciously simple whipped cream recipe made with amaretto. It takes boring whipped toppings to the next level! Click the link to elevate your dessert. 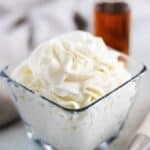 If you follow our recipes then you probably already know we have two other homemade whipped cream recipes. The first one is a basic whipped topping without any frills. The other one is flavored with Irish cream. Kim and I figured, why not add another flavored topping to the site? 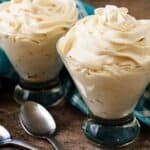 Our amaretto whipped cream is an almond flavored take on the dish. It’s perfect for after dinner drinks like decaf coffee. It doesn’t take long to make and only requires a few ingredients. To be honest, I’m not sure why there aren’t more flavored whipped creams on the market. But, I digress. I assume, you’re not here to chat about trends, you’re here for the food. Let’s get started! As I have mentioned many times before, you always start by gathering your ingredients and kitchen tools. Measure out the amaretto, heavy cream, and powdered sugar. Go ahead and grab a hand mixer and bowl or your stand mixer. After that, combine the heavy cream and sugar in a mixing bowl. Beat them together for about three (3) minutes. The powdered sugar should be completely dissolved. Had we used granulated sugar, your amaretto whipped cream would have been grainy. At this point, increase the mixer speed to medium and whip the cream until soft peaks form. See the picture below as a reference. Then, turn off your mixer long enough to add the amaretto. 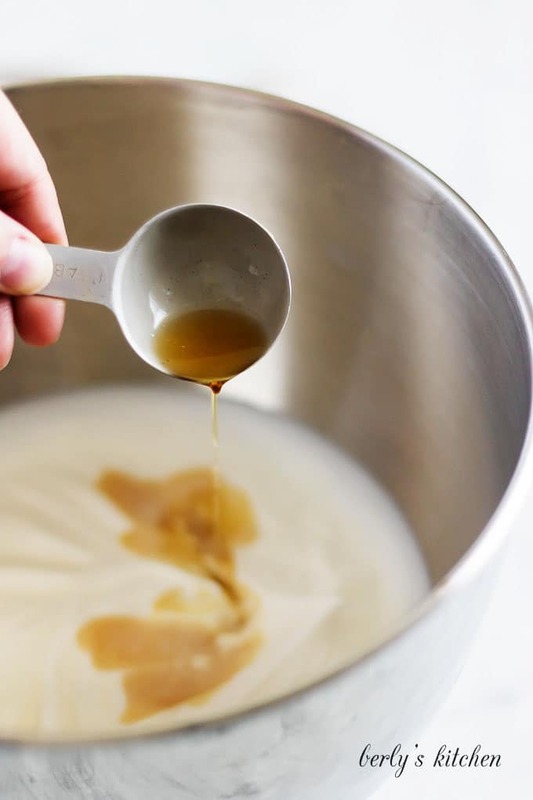 Once it’s added, continue beating the heavy cream until it forms stiff peaks. 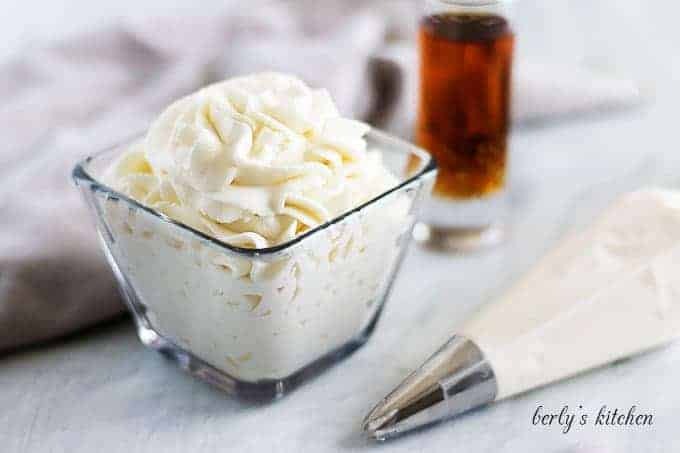 That’s it, your amaretto whipped cream is done! Kim and I hope you enjoyed the recipe and wish you all the best!! I’ve been asked, “What is whipped cream made of?” Maybe not in those exact words, but it has happened in the past. Your basic recipe consists of heavy cream that is whipped with a hand or stand mixer, that’s it. Variations include adding vanilla extract, sugar, various liqueurs, and flavoring extracts like hazelnut or mint. Okay, so you want to make this recipe but don’t care for alcohol. 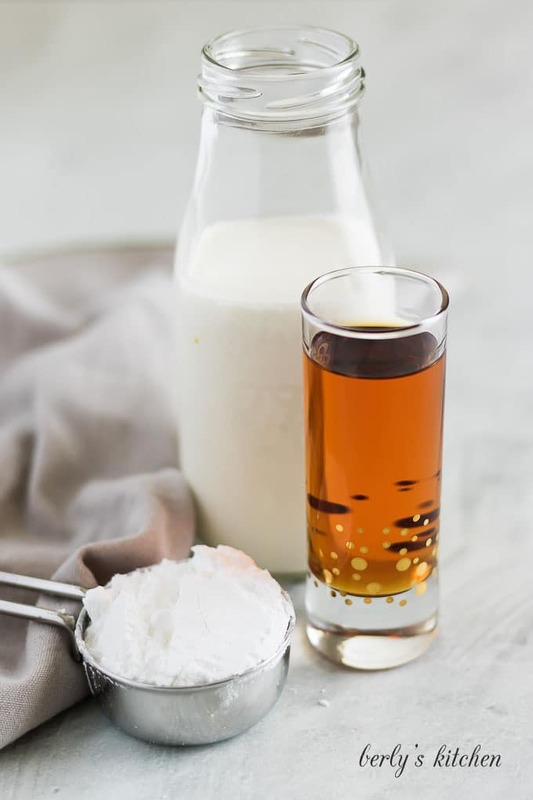 Amaretto flavoring consists of almonds and apricots. So, you can either buy the extracts or buy an amaretto extract and use it instead of the alcohol (Disaronno). However, I would not recommend using the same amount. Try folding in a fourth (1/4) of a teaspoon, then taste test, and add more as needed. “How long does homemade whipped cream last?” Personally, I use my own three (3) day standard. After three (3) days, it’s questionable. Now, you might be wondering, why three (3) days? Well, a long time ago, I was ServSafe certified. That’s a certification in food safety that requires training and testing. Since I can’t remember the exact hold time for every single type of food, I use the standard three (3) day rule. Better to be safe than sorry. 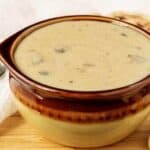 Looking for more condiment recipes? 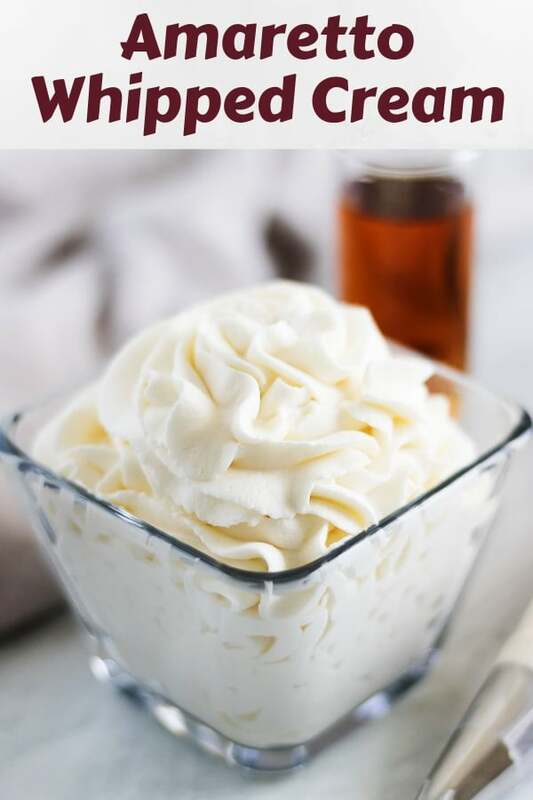 If you enjoyed our amaretto whipped cream recipe, please leave us a comment and rate the recipe card. You can also find us on Facebook, Pinterest, Twitter, and Instagram by searching for Berly’s Kitchen! Add heavy whipping cream and powdered sugar to the bowl of a stand mixer. Use the whisk attachment, and beat on low speed for 2-3 minutes until the sugar has dissolved and is incorporated into the heavy cream. Next, increase the speed to medium for an additional 5-7 minutes or until the whipped cream begins to form soft peaks. Turn off the mixer. Pour in the amaretto liqueur, and continue to mix another 1-3 minutes until stiff peaks form. Serve immediately, and store any leftover whipped cream in the refrigerator for up to 3 days. The calories listed are an approximation based on the ingredients and a serving size of one-fourth (1/4) of a cup. Actual calories will vary. The whipped cream can be stored in your fridge in a sealed container for up to three (3) days.